The terms “disruptive innovation” and “disruptive technology” are at risk of becoming meaningless buzzwords, according to Harvard Business School professor Clayton Christensen, who introduced his theory of disruption 20 years ago. As the number of “unicorn” companies, those valued at $1 billion or more, have captured the public’s attention, the cult of disruption has spread beyond Silicon Valley. Disruption was mentioned more than 2,000 times in articles last year — but most people get it wrong, he writes in the latest issue of the Harvard Business Review. “Disruption” refers to the process that small companies can use to topple industry giants by grabbing a part of the market willing to sacrifice some quality usually for a cheaper price, and then moving upstream by adapting to a larger market. Noting that “too many people who speak of ‘disruption’ have not read a serious book or article on the subject” and that the theory has been refined over the years, Christensen says there are four main points that are either overlooked or misunderstood that cause well-intending managers to make mistakes or critics to dismiss it entirely. 1. Disruption is a process, not a moment in time. Part of the problem, the authors write, is that people have come to think of companies disrupting an industry as soon as they enter with a new way of selling a product. But success through disruption doesn’t come quickly. 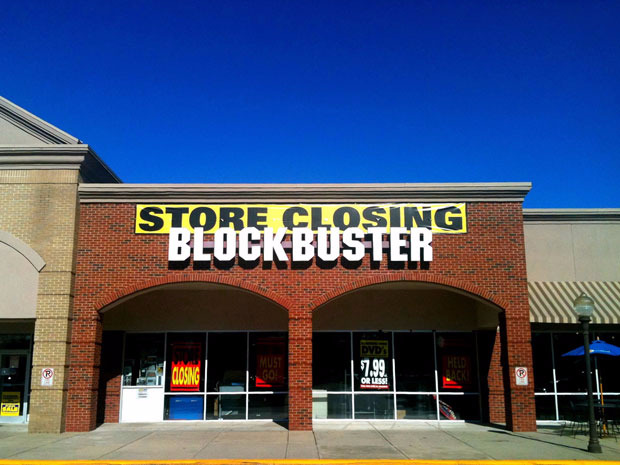 yapsnaps at www.flickr.com | Blockbuster died in 2014. For example, one can consider Netflix’s disruption of the movie rental industry from its inception in 2002 to the demise of Blockbuster in 2012. Netflix entered the industry by taking some of the market that was willing to wait a few days for a DVD to be mailed to their house in exchange for a much more affordable price than Blockbuster or other rental chains offered. “The service appealed to only a few customer groups — movie buffs who didn’t care about new releases, early adopters of DVD players, and online shoppers,” the authors write. Over time, it began to nab more customers from Blockbuster. 2. Disrupters typically utilize different business models, not just different products or services, from incumbents. The authors point to the Apple iPhone as an example of using a business model to disrupt an industry. Its initial success following its 2007 debut can be attributed to its product superiority in the smartphone market, but its lasting success was due to its disruption of the computer market, they say. 3. Disruptive innovation does not guarantee success. Critics point out that plenty of companies that Christensen deemed disruptive have failed. Christensen and his coauthors counter that the theory was never intended to be equated with success, saying it was intended to explain an approach to competition. This is also the reason why some Silicon Valley entrepreneurs incorrectly deem rapidly growing companies to be “disruptive” regardless of their business model, they say. 4. A company does not necessarily have to disrupt its core offering when it is being disrupted. The mantra of “disrupt or be disrupted” can be dangerously misleading, the authors argue. For example, Whole Foods has a small division devoted to online grocery delivery to compete with disrupters like Fresh Direct, but it won’t be dismantling its brick-and-mortar stores anytime soon.